-The King's Curse by Philippa Gregory: I love Philippa Gregory's books, so obviously I had to own this one as well! -The Winner's Curse by Marie Rutkoski: I haven't read The Winner's Curse yet, but I hear amazing things about it and couldn't help myself so I pre-ordered this one. I regret nothing. -The Orphan Queen by Jodi Meadows: OMG ALL THE EXCITEMENT!!! I cannot wait to read this, it sounds AMAZING! -Vanishing Girls by Lauren Oliver: I don't know all that much about it except that it's written by Lauren Oliver and about a sister who disappears. That's enough for me. -The Storyspinner by Becky Wallace: I need this book in my life! It sounds like a very Daisy-type of book! -Open Road Summer by Emery Lord: So basically everyone and their aunt fangirled all over this, so I decided to get a shiny copy and read it soonish. -A School for Unusual Girls by Kathleen Baldwin: EEEE! I'm SO excited!! This sounds really good and I can't wait to read it! -Spelled by Betsy Schow: I will pretty much forever read all fairytale retellings or anything resembling it that cross my path. -The Waterborne Blade by Susan Murray: I'm so ready for the start of what looks to be an epic fantasy series! -Getting Lucky Number Seven by Cindi Madsen: it sounds a bit like the plot of Nine Rules to Break when Romancing a Rake, only contemporary and I LOVE it! -School for Sidekicks by Kelly McCullough: that title alone is reason enough to read this book. 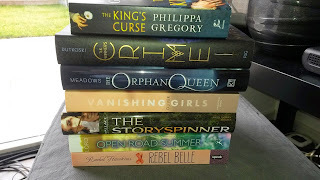 I also got The Orphan Queen and Vanishing Girls this week! They're both so pretty. TOQ is a really good fantasy. I haven't finished the other, but I'm loving it. :) I've heard a lot of amazing things about The Storyspinner, so I may have to try it. Several of this are in my TBR pile too! And I just added Spelled to my want to read list on Goodreads. I can't resist a fairy tale retelling either! Great haul of books! I also have not read The Winner's Crime yet, but I really want to. I keep hearing amazing things. I loved the Orphan Queen! So much!!! I stayed up until 2:00 a.m. on a work night (which I never do!!!) because I couldn't stop reading. Wil is so rational (which is so refreshing), brave, determined, and I just adored her. Read it on a whim and can't get over how much I liked it. Ah, I loved the Winner's Curse! I have yet to read the Orphan Queen, but I am hoping to have the opportunity to soon! Looks like a great haul!